As Commander of H.M.S. Squirrel Osborn was appointed first Governor of Newfoundland. 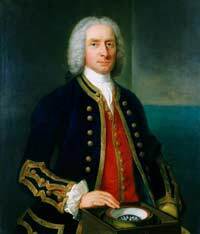 He served as Governor from 1729-1730.
with more information (51 kb). At the same time he delegated power to subordinate naval officers to act as surrogates. On its face neither appointment was inconsistent with the Act of 1699 as long as the justices of the peace restricted their activities to the winter and as long as the naval presence in Newfoundland was seasonal. But in practice the availability of these alternative sources of justice, notably the governor's surrogates, was, according to Reeves, "flown to by the poor inhabitants and planters as the only refuge that they had from the West Country merchants, who were always their creditors, and were generally regarded as their oppressors". The magistrates may have been "but mean people and not used to subject to any Government", according to Osborn.17 That may have been a problem for Osborn, but it suggests that the magistrates were prepared to navigate by their own lights and were applying local conceptions of justice. Fifty years later Reeves noted the magistrates' inadequate training and skills, and their vulnerability to the influence of the local merchant. But he sought not their abolition but their improvement via an infusion of fresh personnel and decent salaries.18 He and his successors ridiculed the inadequacy of Osborn's having equipped each centre with a copy of Shaw's Punctual Justice of the Peace, each embossed in gold with the name of the community, and with copies of the 1699 statute and further Acts on trade and navigation.19 But they were practical aids and probably marked a quantum leap from what the fishing admirals had had at their disposal. Undoubtedly the magistrates met a need. Sitting in Courts of Session year round they acted to resolve local disputes and have enjoyed an unbroken tenure to the present day. During his term as governor, Osborn appointed justices of the peace and constables to a number of centres. Courtesy of The Rooms Provincial Archives Division (PANL GN 5-4-B-1), St. John's, NL. with more information (33 kb).